Twitter data galore: A screen grab from ReSearch.ly. Search engines and free monitoring tools can help you find mentions of your brand easily, but if you want to take your social media efforts to the next level, you may want to consider using a social media monitoring vendor. Once your nonprofit or business reaches a certain size — with, say, hundreds of daily mentions — a paid social media monitoring vendor or service can help you smartly assess the conversations taking place about your brand. In many cases, they offer tools for you to respond and forge deeper levels of engagement. A good paid service will offer not just data but ways for you to draw insight and develop strategy by tapping into actionable intelligence. Please note that we’ve already covered a number of monitoring services in our roundups Top 10 social media dashboard tools and 14 free tools to measure your social influence — including TweetDeck, CoTweet, Seesmic, Spredfast, MediaFunnel, Bit.ly and others — so think of this as a package of monitoring resources. Here is our guide to 10 subscription-based social media monitoring services for nonprofits and organizations, with the most affordable ones listed first. Have your own favorites? Please add them in the comments below. 1An online reputation management and social media monitoring tool created by reputation expert Andy Beal and team, Trackur is sort of a Google Alerts on steroids. Trackur provides all the monitoring tools you need. It is brandable, will rate the sway power of your influencers for prioritized responses and will deliver results to your inbox, RSS feed or Web-based dashboard. Quickly monitor your reputation, check on trends and analyze media mentions for your company, brands, sector, cause or clients. Cost: Four plans range from $18 to $377/month and vary depending on number of searches and features used. Free 10-day money-back guarantee. Clients: 27,000+ users. Affordability makes it popular among small businesses. Owner: Independent. 2We’ve heard good things about Chicago-based Sprout Social, which lets you target and discover new customers or supporters, monitor your brand across the social Web, organize your social networks and manage up to five identities with the basic plan. The service offers an easy-to-digest summary of what’s happening online around your social presence. Cost: Pro Plan at $9/month is geared to small, independent businesses, nonprofits and organizations. Business Plan at $49/month is tailored to larger companies. Free trial. Clients: Chiefly small businesses, independent service providers such as attorneys and real estate agents, bloggers. Owner: Independent. 3A social media monitoring tool that combines powerful features (e.g., historical and real-time data, sentiment analysis, platform filtering) and ease of use, uberVU offers a monthly price that should be more attractive to nonprofits and small and mid-size brands. Cost: Four packages:$49.99/month for individuals, $180/month for popular Plus program, $400/month for big companies, contact team for PR agencies. 14-day free trial. Clients: OMD, Edelman, Sharp. Clients generally consist of small businesses and startups, PR & marketing agencies, bloggers. Owner: Independent. Ready for a listening program? There are a wealth of free monitoring tools to choose from. Free monitoring tools may fill your needs if you work for a small nonprofit or your business has no need for more sophisticated services (coming tomorrow). Just remember: Free monitoring tools aren’t really free — they require an investment of staff time and analysis. Yesterday we covered why monitoring is essential to your organization. Today we’ll look at the wealth of free monitoring tools available to you, divided by functionality. 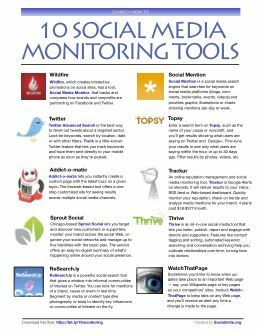 Here is our Guide to Free Social Media Monitoring Tools. Have your own favorites? Please share in the comments. Wildfire: How is your brand performing in social? 1Wildfire, a startup focused on creating interactive promotions on social sites, last month launched Social Media Monitor, a tool that tracks and compares how brands are performing on Facebook and Twitter. Wildfire allows companies, small businesses, marketing agencies, nonprofits and bloggers to create their own branded interactive campaigns — including contests, giveaways, incentive-based surveys and sweepstakes — and to simultaneously publish them in multiple social networks and on their websites. More than 65,000 users have done so. As we understand this, the basic tools are free and Wildfire also sells premium services. 2Social Mention is a social media search engine that searches for keywords on social media platforms — including blogs, comments, bookmarks, events, news, videos and microblogging services — and provides metrics around keywords and “sentiment.” It also provides graphic illustrations or charts showing mentions per day or week. Download the free search bar for your browser and monitor anything from your brand to your cause. They also offer APIs and provide coding for your own keyword monitoring widgets. • Collecta lets you enter any search term to receive real-time results for mentions in social media, in blog comments and on news sites. 3Social media monitoring begins with a dashboard. (See our Top 10 social media dashboard tools.) 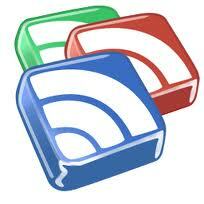 A good choice to begin your monitoring is Google Reader: Subscribe to the RSS feeds of top blogs in your sector, competitors’ sites, news sites, Twitter searches and more, all in one place. You can even subscribe to searches on sites like Flickr and YouTube, so you’ll get an update on any new image or video that matches your brand or cause. If the page you’re on doesn’t seem to have an RSS feed, try Feedyes.com. We also like Feed Informer, which lets you splice multiple feeds together into one and filter for duplicates. 4BlogPulse from NM Incite is an automated trend discovery system for blogs that analyzes and reports on daily activity in the blogosphere. You can keep on top of key phrases, top blog posts, videos, key people news sources and more. But its real power lies in the options you have to track blog conversations based on topics or keywords. See which blogs, news posts, etc., are fueling the most conversations about your brand online.